Shrewsbury Town manager Paul Simpson has been sacked after their League Two play-off hopes were all but ended. Simpson joined Town in March 2008 and led them clear of the relegation zone, before guiding them to the play-off final last year, losing to Gillingham. Shrews captain Graham Coughlan told BBC Radio Shropshire: "It's one of those sad things which happens in football. It's unfortunate and sad. "Make no mistake, Paul is carrying the can for the dressing room." Shrewsbury play Morecambe in their last home game of the season at the Prostar Stadium on Saturday, sitting five points behind the play-offs with two games left. Simpson told the club website: "It is obviously a big wrench to be leaving Shrewsbury Town but I am very proud to have managed the club and to have led them out at Wembley in a play-off final. "I would like to offer my sincere thanks to all of my staff and players for their professionalism throughout my time at the club. "Finally I would like to thank the fans for their support and to wish everyone connected with the club success in the future." 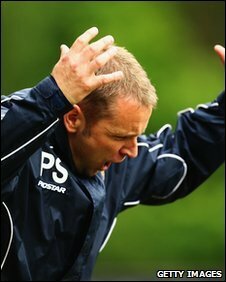 You can have your say on Paul Simpson's departure on a special football fans phone-in on BBC Radio Shropshire 96 FM from 1800 BST on Friday.